A few post ago I wrote about reducing my TBR pile by culling those novels that I decided not to read. Well, here are a couple that made the cut. I read both on my e-reader, where unread books were also accumulating: fatally easy to buy them and just as easy to forget you’ve got them. I’m glad I didn’t forget these. 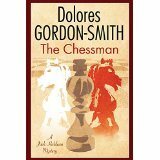 The Chessman is Dolores Gordon-Smith’s new Jack Haldean novel, one of a series set in the 1920s. She has quite a following and deservedly so. In the first chapter, we are introduced to Sir Matthew Vardon, such a deliciously unpleasant character that I was delighted when he kicked the bucket in chapter two, and not surprised that there are rumours that he was helped on his way. It is just the first of several deaths and soon Jack Haldean is brought onto the case. The period detail is deftly handled and the plot kept me guessing. Every time I thought I had worked it, another twist showed me that I had got it wrong. A rattling good read. 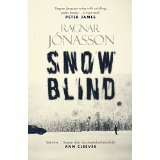 Snowblind is the first novel by Icelandic writer, Ragnar Jonasson. He has translated sixteen of Agatha Christie’s novels, and the set-up here is one that Christie herself might have employed. It is a classic closed community plot. Ari Thor is a young policeman who takes up his first job in Siglufjorour, a fishing village in Northern Iceland. It’s the middle of winter, it’s dark all the time, and snow has blocked the road tunnel that is the only way in. When young woman is found lying half-naked in the snow, bleeding and close to death, and a famous local writer is found dead in the local theatre, the tiny police force are on their own. Great stuff! Everyone, it seems, has a secret and I have to say, I did guess one of them. No matter: it was an engrossing read and a very promising debut. Snowblind is ably translated by Quentin Bates, no mean crime writer himself. No, it’s not fair to be recommending books! We’re all trying to cut down too. I hadn’t heard of either of these, and they sound intriguing…. I have to point out, Moira, that you are constantly reviewing books that I then long to read!